In my down time, especially in the Fall and winter, I love to have a blazing fire in the hearth. While that sometimes happens for us by late October, it is usually into November before we get our first good fire. 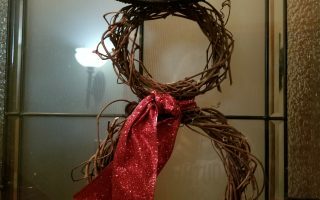 Keep in mind that doesn’t mean we have lit one, it just means that in North Georgia, it isn’t usually REALLY warranted until November. On winter evenings, I love to have a relaxed night, complete with cocoa or hot tea and a big bucket of popcorn. I love to snuggle up in the recliner love seat with both the tinies and cozy blanket and to watch a movie. Granted, no one makes it through the whole thing, but it’s a goal, right? What’s better than that you ask? Good question! Caramel popcorn with Reece’s Pieces, Mini Rolo’s, and fall sprinkles! Ok, so it may be diabetes in a bucket, but it is so so good! It tastes like Fall, smells like Fall, and looks like Fall! Caramel tastes like our trees look when the seasons change – all 5 minutes we get of Fall. This recipe would be great for a Harvest party, Fall themed dinner, or to put in celo bags for a class treat. Be aware that if your little ghostie has not allergies, or anyone in their class does, no treat – no matter how tasty – is worth any child’s safety. Everything but the popcorn itself is made in factories that process nuts – please ask before you share with your child’s class. PSA over. 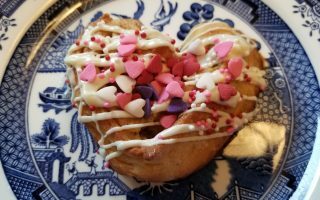 When you start to make your treats, I would make sure I bought the Rolo minis from the candy isle rather than the cutely wrapped seasonal ones in the seasonal isle. The mini ones are already unwrapped and in bulk in the bag. That alone probably sold you. If not, peel an entire bag of the Brach brand caramels – by far the best for cooking – and you will definitely be sold! You can add any fall sprinkles of your choice – mine were a mix of nonparials and jimmies in orange, yellow and brown. They add a tiny bit of edible bling – not that this bowl needs any more jewels. To make this popcorn, you can use any popcorn that you like. I like to use jiffy pop because it has this great dramatic foil blossom at the end that my kids love – and one doesn’t even love popcorn. It is also is already buttered and salted. 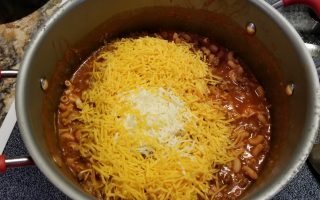 I have to contain myself from eating too much of it before I put it in my recipe. Season popcorn to taste before adding additional ingredients. You want a sweet and salty mix going on here. Melt your caramel in a glass bowl at 30 second increments. It is sugar based, so it will scorch – have you ever burned sugar – it smells like the devil’s bathroom. Avoid it if you can. Use a metal spoon sprayed with pan spray (this helps minimally) to mix in the caramel with your popcorn. 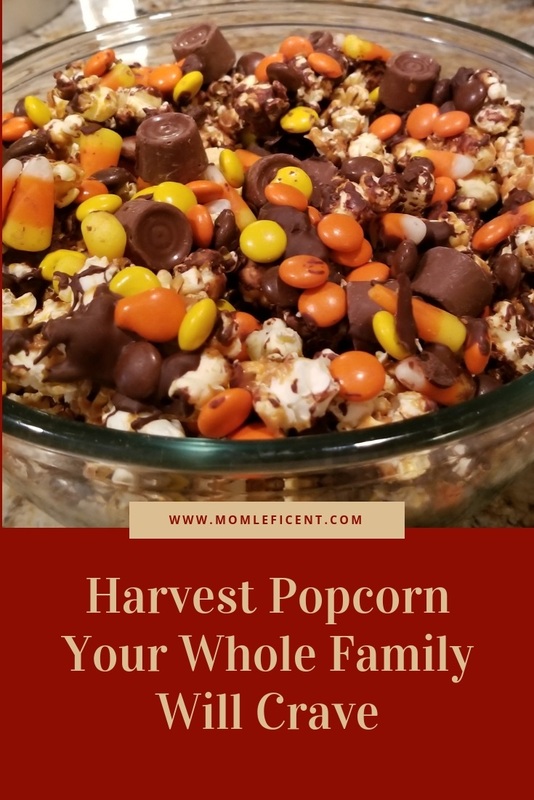 Try to mix it in a large glass bowl if you have one large enough – remember to mix quickly – the caramel will cool and harden rapidly and you want an even coating on the popcorn before it does. Spread the popcorn out on a cookie sheet lined with wax paper. Make the layer as flat as you can without pressing or crushing. 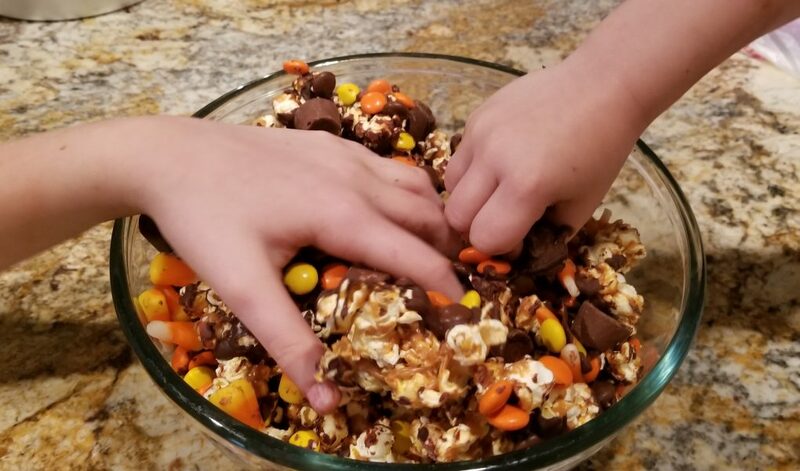 Drizzle lightly with strings of melted milk chocolate to help the bigger candy adhere to the popcorn. Don’t completely coat, just drizzle – think of it as yummy glue. 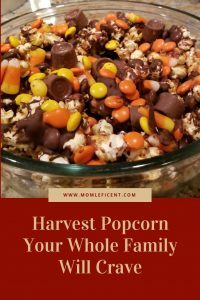 Begin to add your toppings, starting with your candy corn, Rollo’s then Reese’s pieces, then sprinkles to fill in the gaps and add a little color if you have blank spaces. It’s cute that I still think there are going to be blank spaces, right? To keep the candy in place, drizzle again (lightly!) with chocolate to glue in place. You can speed the setting process (and keep tiny hands out rof the popcorn) by placing it in the fridge to set. Break the popcorn up into small clusters and store in an air tight container – provided any lasts the night.